Police in Methuen, Massachusetts are investigating after a local family's dog was shot and killed on Lowell Boulevard on Thursday afternoon. According to Methuen police, a woman came home from work and found the family's German Shepherd, named Moose, shot in her backyard. 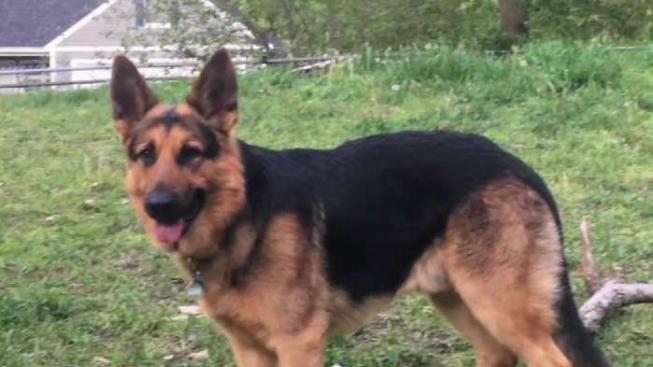 Another one of the family's four German Shepherds, named Creek, was laying on top of Moose, possibly to comfort him while he was dying, police said. Police were on scene Thursday afternoon checking other houses in the area along with MSPCA law enforcement and state police crime scene services. The search included a wooded area, as they looked for the track of the person who may have shot the dog. State police said they were assisting Methuen police in the investigation, and that a fire/explosives section was at the scene with a K-9 trained to detect ballistic evidence. Neighbor David Lemieux, said none of the dogs at the home posed a threat. "You can walk over there and anybody can walk through that gate and they're not going to bite you," he said. "They may be intimidating, but they're not going to bite you because he doesn't own dogs like that." "I don't know why anybody would do something like this," said Ron Hatem, another neighbor. "What do they do? Stop and shoot the dog when nobody was home?" One of the family's other dogs has a graze wound that was discovered on Thursday afternoon. It's unclear if that wound is related to the shooting.